Dan took a vacation week last week and we used the time to do some home improvements. 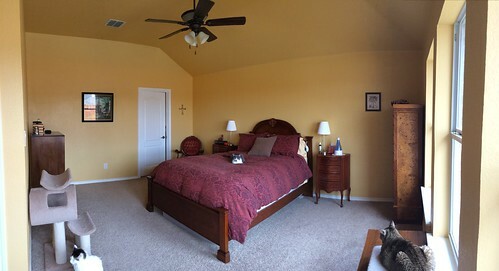 First on the list was the master bedroom. This one wasn't a huge project - mostly just filling some holes from the previous owners, fixing some nail pops, giving it a (matching) coat of paint and getting in a new light fixture. 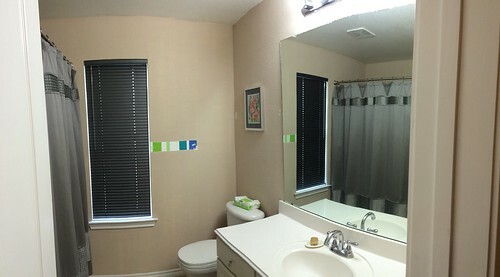 We do still have to figure out what we are going to do with the windows - we are debating between wooden blinds and Roman shades - but other than that (and the eventual house-wide carpet replacement) we are done! 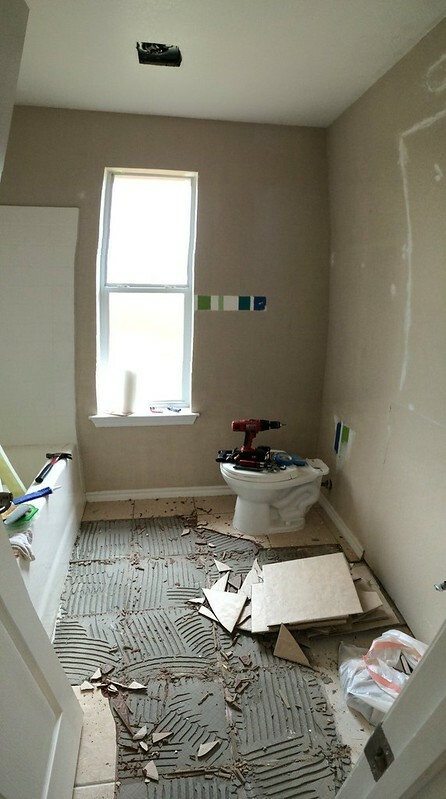 Next up, the guest bathroom. Originally were were just going to paint, but then we decided maybe we wanted to go ahead and replace the vanity sooner rather than later and things just snowballed from there. This project is, naturally, going to take a bit longer than the bedroom as we are pretty much gutting and redoing the room. We still have to finish taking up the floor tile and removing the fiberglass tub/shower combo thing. But we already have a vanity and mirror purchased and new tile picked out for the shower so we are making slowly moving forward! Dan also got some beer brewing done this weekend; he made a golden stout and an kind-of imperial stout. No pictures of that, but the kitchen in the midst of the brewing looked very similar to the in process picture of the guest bathroom above.